"US boatbuilder Carver says it invested 60,000 hours in the design of its... luxury cruiser, the Voyager 530 Pilothouse and it appears it's been time well spent. The flagship of a range that spans 20 motoryachts, sedans and cruisers, the Voyager 530 retains its maker's trademark efficient use of interior space, combined with an injection of European megayacht styling - both inside and out." ~ Redbook Australia Boat Review Website Betty Jean is your typical New England yacht. Seeing 3-4 months a year of in water time, the rest of the time being under cover. Showing like a significantly newer yacht, yet priced with the pack, this yacht represents a nice opportunity to own a proven cruiser in above average shape, ready to cruise now. Come take a look or make an offer you will not be disappointed. United Yacht Sales New Jersey would love to guide you through a personal showing of this 53' Carver 530 Voyager Pilothouse 2000. This yacht for sale is located in Belfast, Maine and priced at $295,000. For a showing please contact us by filling out the form on this page and we will get back to you shortly! The bridge enclosure is 2" welded aluminum pipe with a extended cover that has ridgid glass forward and aft and flexible Strataglass to the port and starboard sides so the windows can be opened, for a breeze. There are two access points to get to the fly bridge. One is a ladder at the cockpit and the other is stairs through the pilot house. Aft of the fly bridge helm is a U-shaped settee with seating for ten. At the center is settee is a table that drops down and creates a sleeping berth for two. At the fly bridge helm is a full suite of electronics, so the vessel can be piloted from the pilot house or fly bridge. At the rear of the fly bridge is a 600 lb dinghy davit crane with a cradle on deck for a hard bottomed inflatable. As you come down the steps into the staterooms immediately to your port side is the Master. There is a center line Vera Wang mattress, with opening ports behind the berth. Over head is recessed lighting, and reading lights on either side of the berth. The master bath is directly across from the berth. In the center is the vanity with a sink and storage below. To the right is a enclosed Shower with a small bath tub, and to the left of the vanity is a separately enclosed Vacu-flush freshwater head. Hidden behind sliding cherry doors is a Malber washer and dryer. There are two large cedar hanging closets and storage drawers below the berth. A Certified Professional Yacht Broker (CPYB) is recognized as having achieved the highest level of industry accreditation, available only to fully-qualified yacht sales professionals. The CPYB program is administered by Yacht Brokers Association of America in partnership with Florida Yacht Brokers Association, Northwest Yacht Brokers Association, California Yacht Brokers Association, Boating Ontario Dealers, British Columbia Yacht Brokers Association and Gulf Coast Yacht Brokers Association. 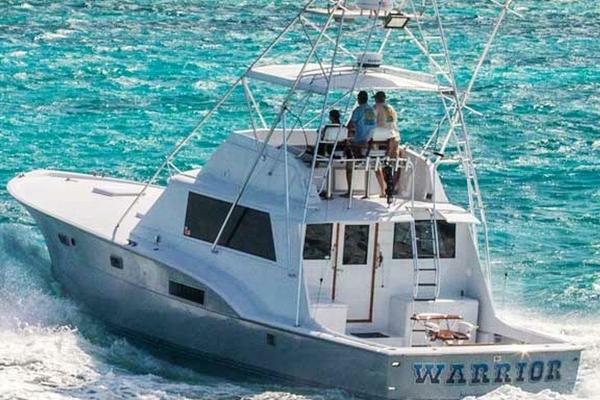 The CPYB program is also endorsed by the Marine Retailers Association of the Americas (MRAA) Marine Industry Certified Dealership (MICD) program and leading yacht manufacturers as a key component of their own industry standards; the highest level of achievement for their member yacht sales professionals. Experience & Validity The CPYB designation is earned by eligible yacht sales professionals, who, after serving a minimum of three years as a full-time professional, have successfully completed a comprehensive written examination to validate professional competency. Continuing Education A CPYB is committed to their personal and professional development through continuing education, as mandated for CPYB recertification every three years. Ethics & Standards A CPYB adheres to, and is accountable to, a nationally recognized Code of Business Ethics and conducts yacht sales transactions in accordance with a stringent set of industry standards of practice. Fiduciary Responsibility A CPYB maintains a dedicated escrow/trust account to protect their client’s funds. A CPYB understands their fiduciary responsibility and obligations with respect to client funds. Transaction Management A CPYB uses proven, industry-recognized transaction documents, which fully and clearly describe all terms and conditions of a transaction. Honesty & Integrity A CPYB maintains the highest standards of professionalism, acting with honesty and integrity. Trust & Confidence A CPYB instills confidence, trust and consistency in all transactions involving fellow yacht sales professionals for the benefit of the client.